Tiles are a sure fire way of adding layers of texture, colour, pattern and excitement to any space. They amplify your bathroom, laundry or kitchen in unique ways. While selecting tiles can be tricky, the key is cohesion and creating some sort of relationship between each room, even if very little. 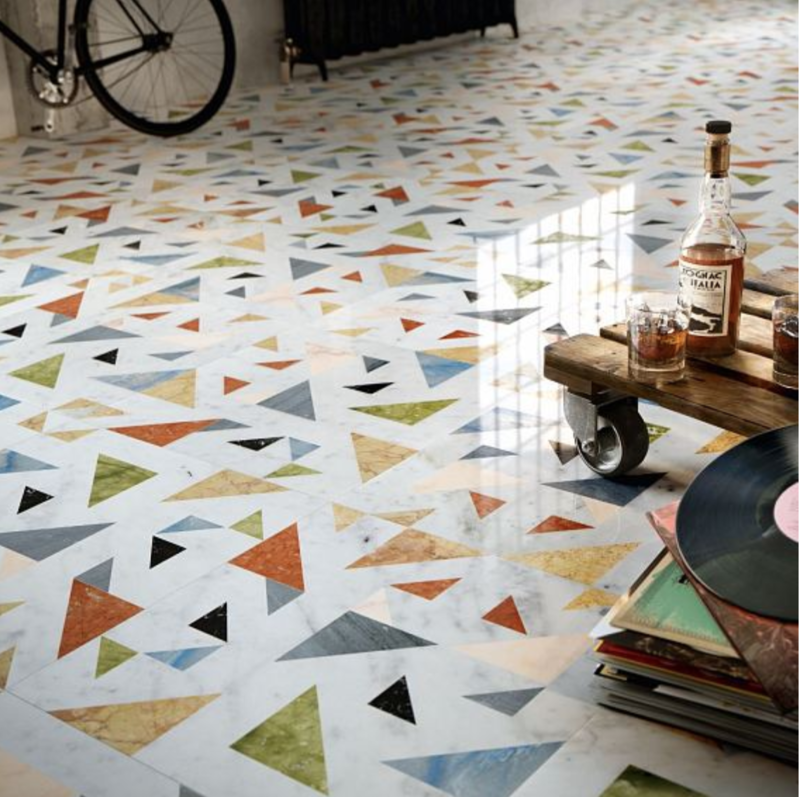 We have listed below our favourite tiles of the season, from classical to radical, all with lasting power however. The classic go to for creating a timeless effect is opting for a stone mosaic tile. Patterns and colour pallets are endless, so its rather adaptable for spaces of different proportions. A honed Carrara basketweave is used traditionally in heritage bathrooms. For a different take, try placing them in entry foyers or hallways. A more radical version of the class mosaic would be experimenting with shapes. 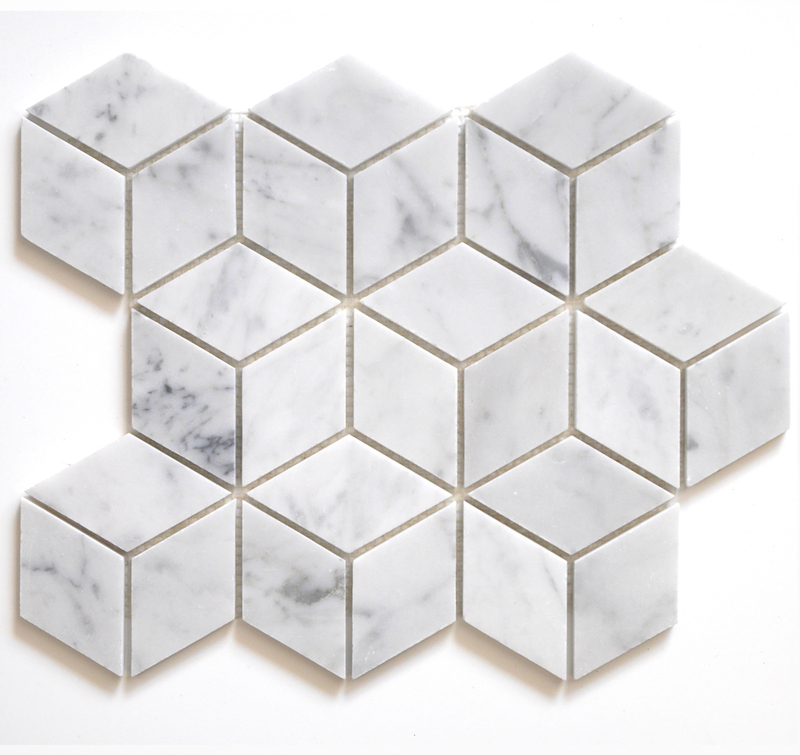 Try a honed cube Carrara which is most noteworthy for its 3D effect. Its a fun play on the timeless heritage material with a contemporary pattern and design. Further to the above alternative and more modern interpretation of tile choice, is a new product from a favourite supplier, Art Domus. An exciting floor tile of polished marble sourced from Italy, the Opus Allegro designed by Lithos is a spicy contribution to any renovation, while maintaining a clean palette despite the rainbow of colours. While perhaps not being a tile that we may get to use very often, this particular product is an inspiration and a whole lot of fun. The final tile of the moment is one that is sweet and playful, yet completely timeless and lasting. Used for decades, the Penny Round tile has been repeated in many colours and finishes. These range from matte to gloss, from marble white to bright pink. We believe the penny round is a quick and effective way of creating elegance mixed with the perfect balance of youth. Hence the use in many projects throughout the years. Tera Nova supply one of the favourites, as seen in Bondi Apartment above. For more favourites and update to date material choices, go to our instagram @rotharchitecture.